Comfortrite Wide Slippers For Men - Extra Wide Extra Deep,Get these Comfortrite Wide slippers for men for extra width and added comfort. Extra wide, extra deep! Get these Comfortrite Wide slippers for men for extra width and added comfort. Extra wide, extra deep! These are the perfect slippers for men with a wide toe bed which can easily fit into swollen feet and ankles. 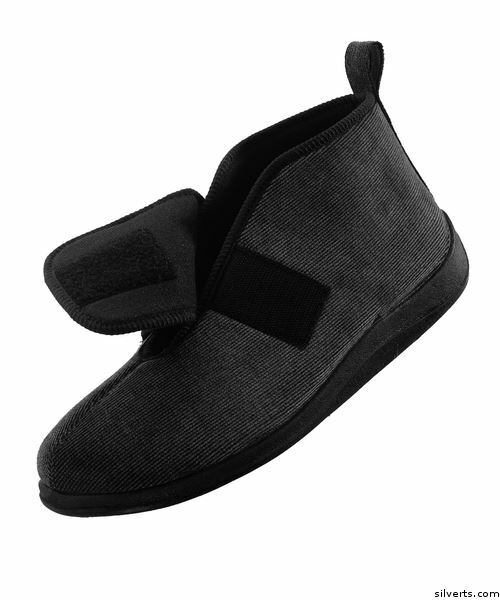 These foamtread wide fitting bootie slippers have a hook and a loop fastener which is adjustable. There are finger loop pull on tabs that are easy on arthritic fingers. Sole is anti skid which prevents falls. These slippers are a perfect gift for home care, hospital or nusring home. Comes in 2 colors and different sizes. 7 10" accomodates upto 10 1/4"
8 10 1/4" accomodates upto 10 1/2"
9 10 3/4" accomodates upto 11"
10 11 1/4" accomodates upto 11"
11 11 1/2" accomodates upto 11 1/4"
12 11 3/4" accomodates upto 11 1/2"
13 12" accomodates upto 11 3/4"
14 12 1/4" accomodates upto 12"